Productivity is a quality criterion in the assessment of textile machines. Increasing the operating speed is a measure in order to increase productivity, but is often accompanied by unwanted vibrations. Due to noise radiation and degradation of the end product, these vibrations confine the increase of the operating speed. On the base of a chain stitch machine, the reasonable employ of mass balancing and power smoothing in order to decrease vibrations is stated. The reduced mass moment of inertia of the mechanism onto the drive shaft is employed to draw conclusions on the optimization potential of particular links. Using these methods, corrective measures are developed to enable a higher operating speed of the machine. 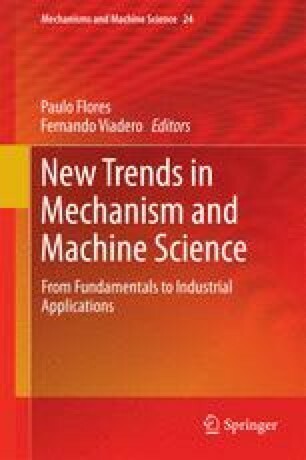 A multi body model is generated in order to quantify the effects of the approach, showing good improvement in the vibrational behavior of the machine.